My people, life has been happening... Happening in a way where there are so many good and exciting yet scary things going on with my life until I have not had the time to get the books that are running around in my brain out on paper! However, I am not complaining, but I am actually trying to enjoy the ride! So, here is the first book that has been dying to get out! About a month or so before school ended, I did my choice novel unit with my students, and being that they all have their own computers, they were able to do a great, group project that I will share with you soon. Anyway, many of the teachers in my school are giving students choice in what they read, and many of the students are reading and loving Thirteen Reasons Why by Jay Asher. Even in my classroom, many students had read or wanted to read this book. 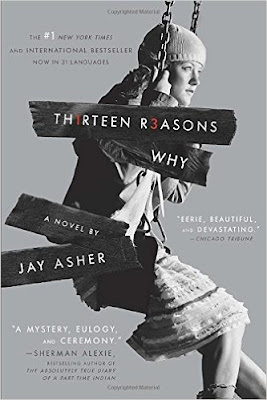 After all of the hype about Thirteen Reasons Why, I decided to give it a try so that I could it discuss it with the students who were reading it. One of the protagonist, Hannah Baker, has actually committed suicide, and she leaves behind a series of tapes explaining why she committed suicide. It took me a minute to get into this story, because the plot sort of moves slowly with the mixing of Hannah’s story with Clay Jenson’s story, the guy who is in possession of the tapes. However, Jay builds the suspense and makes this book one that makes the reader want to read to find out why Hannah killed herself. At first Hannah came across as a hero to me; the girl who is making her friends and foes feel bad about causing her to commit suicide. However, my students thought that this book was not about Hannah at all but was about the people who caused Hannah to commit suicide. They saw this as an anti-bullying book that can cause a person to think about how his action may effect another person. (I love discussing books with my students.) This was one of those ‘aha conversations’ that caused a shift in my thoughts, and because of that shift, I am highly recommending this book to middle and high school students; it is easy to read, deals with teenager issues, and just may cause a young adult to think about how his actions may impact the life of another person. Adults, I am also encouraging you to read this book, because Hannah did reach out to a few adults, but the adults seemed to miss or just did not quite understand how to help her. Heavy, easy read that students seem to love, and any book that gets students to read is a good book!